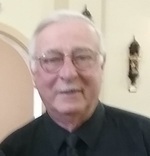 Frank A. Sangillo, 83, passed away on Thursday, April 4, 2019 in Lady Lake, Florida from cardiac complications. Frank was born in Portland, Maine on March 10, 1936. He was a graduate of Portland High School, class of 1954. After graduation, he enlisted in the Marines and after leaving the Marines went on to graduate from Emerson College in Boston with a degree in Communications in 1962. Frank worked in Sales starting with the National Biscuit Company and Cutter Laboratories and, in 1973, began a long career with Honeywell Information Systems, eventually transitioning into his own commercial real estate business in San-Terra Associates. Frank also worked part-time as dee-jay for WGAN Radio on Sunday mornings. Frank never really retired. He drove school busses for North Yarmouth Academy, the Portland School Department as well as the Cape Elizabeth School Department. He also worked for Custom Coach driving tour busses and limousines until he was 80 years young. Those who had the pleasure of having him as their bus driver will remember that he always kept a joke book with him on these trips, not that he really needed it, and would entertain the passengers with a few jokes now and then. Frank and his wife Patti, both devout Catholics, were very active in their church as well as their community. They sang in the choir at St. Peter’s Church in Portland and in the Portland Community Chorus, participating yearly in the Magic of Christmas. They spent their summers on Brandy Pond in Naples, ME and when Frank got tired of the cold Maine winters, he and Patti sold their camper in Naples, purchased a motor home and ventured to Lady Lake, Florida where they would spend the winter months with the large group of new friends and new church family. Frank and Patti were fortunate in 2017 to accompany their fellow choir members from St. Timothy’s on a trip of a lifetime to Italy and the Vatican in Rome where they sang for Pope Francis. In his spare time….yes after all he was doing he evidently still had spare time…..Frank volunteered with Habitat for Humanity in Florida and in Maine, building houses with other volunteers in Freeport and Scarborough. Frank volunteered for more than 50 years, most recently in 2018 at the age of 82, in the “garage” of St. Peter’s Church cooking pizza for the annual Feast of St. Rocco Italian Bazaar held every August. Frank was predeceased by his parents, Adam and Olive Sangillo, a son Christopher, and his brother Adam Sangillo. He is survived by his wife Patricia Sangillo of Cumberland Foreside, Maine and Lady Lake, Florida; his daughters: Lisa Sangillo of Standish, ME and Heather Proctor of Dresden, ME; his son James Sangillo of Gorham; grandchildren: Bryen Rogers of Sanford, FL; Justin Smith of Houlton, ME; Neico Proctor of Lyman, Carly Bell of East Waterboro and Hunter Proctor of Brunswick. He is also survived by his siblings: James Sangillo and his wife Frances of Surry, ME; Patricia Sangillo of Contoocook, NH; Michael Sangillo of Gray, ME; Karen Sangillo of Arundel, ME; Kathleen Sangillo of Saco, ME and Thomas Sangillo of California. A Mass of Christian Burial will be celebrated on Wednesday, April 10, 2019 at 10:30 am at St. Timothy Catholic Church in Lady Lake, Florida. A Memorial Service will be held at St. Peter’s Church on Federal Street in Portland on a date to be announced with a Celebration of Life reception afterwards at the Italian Heritage Center on Westland Avenue in Portland, ME. In lieu of flowers, donations may be made to Habitat for Humanity of Greater Portland, 659 Warren Avenue, Portland, ME 04103. Frank would give someone the shirt off his back if they needed it, so, in his memory, please practice random acts of kindness. To send flowers to the family of Frank A. Sangillo, please visit our Heartfelt Sympathies Store.